Google Docs is one of the most famous web clouding documentation platform. You can create documents, spreadsheets, presentation online on Google Docs and share that with others as well. If you want to have a collaborative document so that other people in your office of friends may edit the same, then here is the procedure to invite and share created documents on Google Docs. [ad id=’9′ style=’float:left;margin:10px 10px 10px 0′] First of all you need to create a new document which will be auto-saved in few seconds only. Now follow below steps to invite and share with others. 1. 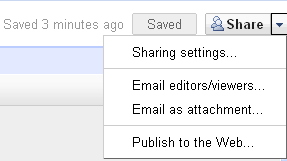 As you have already created a document on Google Docs, Now to share with others, click on “Share” button available on top-right corner (beside the Save button). 3. You can add a message with the document notification email as well. That is optional, so you can share without message if you want. 4. There are few options like “send a copy to yourself” and “paste the item itself into the email”. But you may choose only the last option which says “send email notification” to person with whom you are sharing this document. Under the Share button, there is a dropdown to do few more things related to sharing stuff. Like “Email editors/viewers” and “Email as attachment” to let you communicate with people who are eligible to view and edit the document. I think, Google Docs is very useful for startup companies and small businesses. I use Google Docs in my office and share docs with others very frequently. I hope, this small tutorial will help you share your documents on Google Docs and use this awesome documentation platform at best.